One of the most frequently cited violations from the Occupational Health and Safety Administration (OSHA) is often related to improper guarding of machinery. Equipment such as table saws, bench grinders and hydraulic presses are often for OSHA citations. The citations related to machine guarding issues are most often classified as a ‘serious violation,’ meaning the violation could result in a significant injury or death. As a result, the machine guarding citations that meet the criteria for a serious violation can be penalized up to $12,934 per occurrence. Bench grinders are the tool that receives the most citations related to machine guarding. Most marinas or boatyards have at least one bench grinder. Often, during the course of replacing an abrasive wheel, the guards are removed from the grinder. Once the wheel is changed, employees often fail to reinstall the guards to the grinder. Each bench grinder should have three important guards. A bottom guard or tool rest should be present and should be adjusted to within ¼ inch of the wheel. The top guard should be adjusted to within 1/8 inch of the wheel. The side guard should cover at least 75 percent of the wheel, the spindle and the nut securing the wheel. If a bench grinder does not have these three guards, and the guards are not available for replacement, replacing the grinder is recommended. The OSHA regulations related to bench grinders can be found in 29.CFR.1910.215. Table saws are another tool that is often operated without the proper guards. Portions of a circular saw that someone may come in contact with must be covered with an exhaust hood or guard to prevent accidental contact. Very often, the guard is removed due to employee personal preference. Removing the blade guard exposes employees to the rotating blade. Without this guard, employees can be exposed to potential injuries including lacerations, eye injuries and amputation. Very often, the guard is located near the saw and can be easily reinstalled. All other saws such a chop saws and radial arm saws also have requirements for guarding a rotating blade. The OSHA regulations related to table saws and all other woodworking tools can be found in 29.CFR.1910.213. 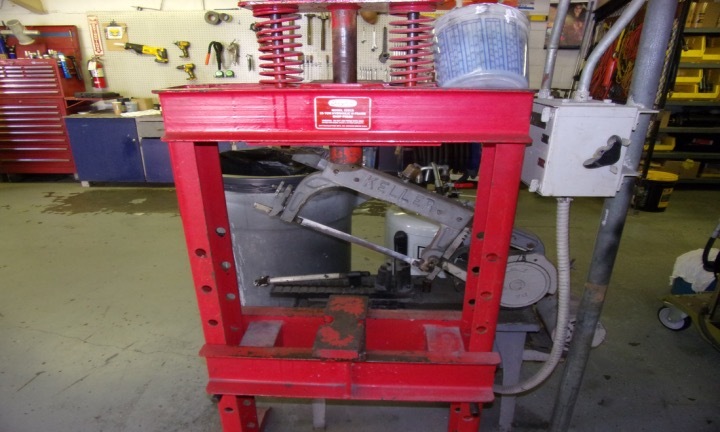 Very often, in the marine service area, a hydraulic press is a must have tool. However, the press is often a tool that is improperly guarded. In most cases, it seems a guard for a hydraulic press is not provided with the machine. Several years ago, a marina in the Midwest received a citation related to a lack of proper guarding on the press. After the citation, since a guard was not provided by the manufacturer, the marina worked with OSHA to develop and gain approval for a proper guard. Other areas of concern when it comes to machine guarding include the covering of belts, pulleys, shafts, gears or other moving parts that may form a nip point. 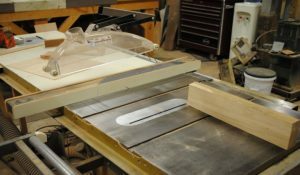 In woodworking areas, this is very often related to sanding machines or older equipment that may not guard items such as drive belts. Guards should be in place to avoid accidental contact, exposure to pinch point, possible amputation hazards, or flying objects. One last common violation related to smaller equipment is often related to anchoring the equipment. Tools such as bench grinders, drill presses and hydraulic presses are required to be anchored to a workbench or the floor. See OSHA regulation: 29.CFR.1910.212(b)- Anchoring fixed machinery – machines designed for a fixed location shall be securely anchored to prevent walking or moving. With penalties related to machine guarding often rising to the level of a serious OSHA violation and the associated penalties of up to $12,934 per occurrence, a review of machine guarding exposures is recommended. In many cases, the cost to replace unguarded machinery is significantly less than the cost of the potential OSHA penalty or worker’s compensation claim that may result from an injury. If new equipment is installed or guards are returned to existing equipment, it is vital to introduce and consistently enforce a policy that maintains proper machine guarding. Robert Smith is executive director of Fisher Phillips Safety Solutions, a firm specializing in workplace safety in marinas and boatyards. He can be reached by phone at 757-589-5391.